Ya, ya.. I know it's important to read my Bible. But a closet Bible study is pretty easy to fake when you've grown up in Church. It's not like I'm going to read something new in the Bible! So I am about to propose something BIG, something that will let MY READERS know when I'm not reading something daily. I have tried blogging with the 1 Thing I Learned Today tag. And that's cool & all, but I have not kept it up. I need to do something that does not require formatting an entire blog entry around it. There's just too much work to do when sitting in front of a blank screen with random thoughts floating from earlobe to earlobe. IF you follow me on twitter, you may have noticed a new trend. From approx 12.30 PM to 1 PM, I have been posting links that have the root bible.us in it. These are notes that I have been taking from my daily readings during lunch. I got to thinking, why don't I create a hashtag & make this a formal twitter tag? 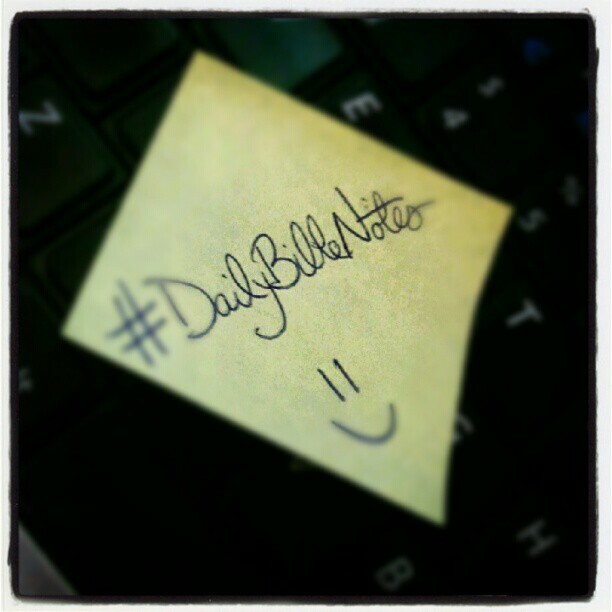 I will be tweeting out my notes using the hashtag #DailyBibleNotes. I read from the YouVersion Bible on my phone. This lets me write notes right in the app and make them public on Twitter & Facebook. Since this will be a public activity, it will create accountability for myself. However, I also invite my readers to join the conversation! Anyone can tweet with this hashtag. I challenge YOU to read one chapter every day and tweet YOUR observations about the text. With the rough notes already online, it helps organize my thoughts for blogging. I can take my notes and expound on them in a coherent way. Yay!